Tired? Inflamed? We have ideas for you! We want to introduce you to the INNATE products that we always make sure to have on our shelves to support you. InflammaComplete: This herbal supplement packs in a gently powerful blend of anti-inflammatory herbs that can support folks struggling with any number of chronic or acute inflammatory conditions. Tumeric is the star of the show, with ginger, cranberry, holy basil, black cherry and black pepper playing supporting roles. Whether you’re suffering from gut inflammation or inflammation related to an injury or chronic illness, InflammaComplete can help you get back on track. While some folks report that they experience the best results when they take this supplement on a daily basis, others use it in place of an over-the-counter anti-inflammatory when they’re experiencing acute inflammation, and because it is useful for gut inflammation as well, it is unlikely to produce the kind of discomfort that many people experience when using pharmaceutical anti-inflammatories. Because we are passionate about helping people recovering from injury, we like to have this product available to support patients as they heal, but we also love to see the impact it can have on folks with chronic inflammatory conditions who use it regularly. Adrenal Response: If you experience tiredness even upon waking in the morning, difficulty losing weight, a reactive and anxious mental/emotional state, and you self-medicate with caffeine to get you through the day, you may be suffering from adrenal fatigue. Our adrenals are the glands that regulate our stress hormones, and when we’re in a chronic state of stress, eventually they stop working effectively and we experience the symptoms of adrenal fatigue. 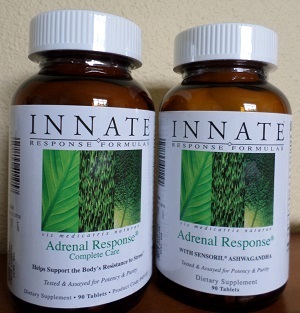 The INNATE Adrenal Response formulas include adaptogenic herbs ashwaganda, rhodiola and astragalus. When beginning the regimen, we recommend that patients start with Adrenal Response Complete, which also includes B vitamins, that are often depleted by stress. Once you finish that first bottle of Adrenal Response Complete, your B vitamin stores should be re-stocked, and you can then move on to the regular Adrenal Response, which contains only the adrenal-supporting herbs. Our owner and chiropractor Dr. Jordan Weeda, a busy papa in addition to being a busy chiropractor, finds that these supplements help keep him going when life just won’t let up.